An international meeting of medical professionals convenes this weekend at the 15th Annual ILADS Conference to exchange the latest diagnosis and treatment options for Lyme disease and associated tickborne illnesses including Morgellons disease. A strong presence at this conference will be the Charles E. Holman Morgellons Disease Foundation (CEHMDF), led by director Cindy Casey-Holman, RN. Morgellons (MD) is a debilitating multi-system illness characterized by the formation of unusual fibers and filaments within the skin, slow-healing skin lesions often accompanied with overwhelming fatigue and an array of neurological deficits. During the 3 day conference, several members of the Holman Foundation will host an exhibit providing information and offering practical demonstrations in the proper examination of the skin and identification of the unique fibers. This exceptional opportunity will offer a hands-on learning experience to clinicians increasingly confronted by this baffling disease. The coalition of experts from the Holman Foundation attending this year’s conference include Robert Bransfield, MD, FAAP (Psychiatry, USA); Cindy Casey-Holman, RN (RN, USA); Nancy Egger (USA); Marianne Middelveen, MSc, MDes (Veterinary Microbiology, Canada); Carsten Nicolaus, MD, PhD (Internal Medicine, Germany); Ginger Savely, DNP (Doctor of Nursing Practice, USA); Harold A. Smith, MD (Emergency Medicine, USA); Raphael Stricker, MD (Internal Medicine, Hematology and Immunology, USA) and Amelia Withington, MD (Psychiatry, USA). During the weekend conference Dr. Bransfield will give several presentations and participate in panel discussions related to the neurological impact of Borrelia; Dr. Savely will lead a Plenary Session titled Laboratory Analysis of Tick Borne Diseases, as part of the Lyme Disease Fundamentals Course. She will also host a Breakfast Roundtable for NP's and PA's; Dr. Stricker will be inducted as the new ILADS President. Compelling evidence as to the association between Lyme and Morgellons diseases was established in 2011 when Marianne Middelveen and Raphael Stricker et al. researched specimens taken from Morgellons patients. Since the condition was first recognized in 2002, the paralleling symptoms between the two conditions seems inexplicable to medical care providers. In 2010 a study by Ginger Savely, DNP, titled, Morgellons disease: Analysis of a population with clinically confirmed microscopic subcutaneous fibers of unknown etiology, (Savely, V. & Stricker, R.) was published with surprising information showing nearly 97% of 122 MD study subjects had Lyme disease. Ongoing research funded by the Holman Foundation allowed the use of histological staining, immunofluorescent staining, electron microscopic imaging and polymerase chain reaction (PCR) genetic testing. Resulting study evidence released in 2013 further substantiated the involvement of the spirochete, Borrelia, in the etiology/pathogenesis of Morgellons disease. Furthermore, motile (living) spirochetes also identified as Borrelia, grew in culture medium inoculated with Morgellons dermatological specimens. Several mirrored studies have produced the same scientific findings of Borrelia in Morgellons specimens, supporting MD as an infectious illness of major public health concern. Lyme disease, also referred to as Borreliosis, is an infection caused by the same bacteria Borrelia burgdorferi discovered in Morgellons. The Borrelia burgdorferi bacteria are transmitted to humans and animals when they are bitten by an infected tick and can result in severe debilitating health issues. Lyme disease has gained the nickname "The Great Imitator” since symptoms mimic other conditions, causing great difficulty in diagnosing. New figures released in August 2013 by the Center for Disease Control showed that approximately 300,000 people contract Lyme disease each year in the US. The CDC estimated that the total number of people diagnosed annually with Lyme is roughly 10 times higher than previously estimated. The detection of Borrelia in Morgellons, while providing evidence of a physiological cause, also adds to the medical difficulties and chaos surrounding the condition. Research findings of Borrelia involvement with Morgellons disease should squarely place MD on the radar to be closely watched and managed as vigilantly as with any infectious illness. However, the significant research findings have been largely ignored by the mainstream medical community for reasons that are unclear to the inquiring public. The dangers of Borrelia are far reaching and frightening. This treacherous spirochete has also been linked to other perplexing and life-impacting conditions including Multiple Sclerosis, Chronic Fatigue Syndrome, Fibromyalgia, Alzheimer and complications of pregnancy including preterm births, spontaneous abortions and stillbirths. Morgellons disease is just the latest addition to Borrelia's list of decrepitude. The Charles E. Holman Morgellons Disease Foundation, based in Austin, TX, is a 501(c)3 nonprofit organization committed to advocacy and philanthropy in the battle against Morgellons Disease. The foundation was named for Charles E. Holman, a pioneer in the fight against Morgellons Disease, and is led by Director Cindy Casey-Holman, RN. The Holman Foundation will be hosting “The 8th Annual Morgellons Medical Conference” March 28th-29th, 2015 in Austin, TX. 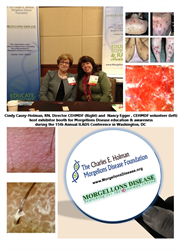 Prospective presenters, exhibitors and sponsors for the 2015 Morgellons conference may obtain information at http://www.MorgellonsDisease.org.